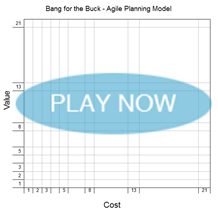 Bang-for-the-Buck involves collaboration among the product manager and development team to prioritize backlog items. Rather than blindly moving down your agenda without any direction, this game allows you to analyze the costs and benefits of each task, and to organize them in a way that shows you where to begin and in what order to go in. Graph each item against cost and value so you can prioritize your to-do list and start checking items off. Before the meeting, draw a graph with the “value” of the items on the y-axis and the “cost” of them on the x-axis, organizing each axis as a Fibonacci number. Write each backlog item on a sticky note and post them by the chart. Next, give your players sticky notes and pens so they can each write other backlog items. Have them place their tasks along with the ones you posted. As a group, take time to discuss where each item belongs on the graph. 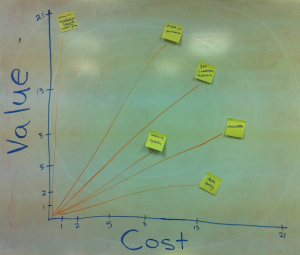 The product manager should focus on what the “value” position of the task is, while the development team concentrates on the “cost” placement on the x-axis. With multiple players, you can get different perspectives on the aspects of each item. After all the items have been posted, use the chart to get started on your agenda. Follow the graphed items in a clockwise order to optimize value delivery. This game is helpful to prioritize both short-term and long-run tasks. If one item must be accomplished soon but is too costly to start right away, work together to identify how to move it to the left on the graph. By comparing the value and cost of each item, you can collaborate to alter approaches for the tasks depending on which are most important. The discussion and visualization involved in Bang-for-the-Buck helps you think differently about where to begin working. This not only increases efficiency and productivity, but also allows you to see an impact faster. Clicking on this image will start an online version of Bang-for-the-Buck at innovationgames.com. You’ll see this image as the “game board” and an icon of a light bulb in the top left corner of this window. The light bulb represents the backlog items you want to prioritize. To add a backlog item onto the game board, simply drag it from the top left and describe it. While any player can move a light bulb at any time, the game works best when the product manager focuses on getting the light bulbs in the right place vertically, while the development team puts the items in the right place horizontally. Use the integrated chat facility to negotiate about the items. And any player can edit the items to keep track of the agreements of the team. This means that items will move around during the game as the value of an item increases or decreases or the development team considers various ways of implementing an item. To get the final results of the game, simply download the Excel spreadsheet. All of the items and their Fibonacci values will be available to you for post-processing, including all of the chats.